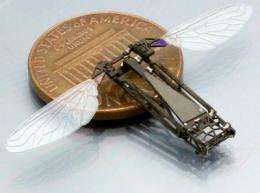 U.S. defense agencies, which have funded this research, are supporting the development of bug-size flyers to carry out reconnaissance, search-and-rescue and environmental monitoring missions without risking human lives. These devices are commonly called micro aerial vehicles or MAVs. "For military missions in particular, these MAVs must be able to fly successfully through complex urban environments, where there can be tight spaces and turbulent gusts of wind," said Tiras Lin, a Whiting School of Engineering undergraduate who has been conducting the high-speed video research. "These flying robots will need to be able to turn quickly. But one area in which MAVs are lacking is maneuverability." To address that shortcoming, Lin has been studying butterflies. "Flying insects are capable of performing a dazzling variety of flight maneuvers," he said. "In designing MAVs, we can learn a lot from flying insects." Lin's research has been supervised by Rajat Mittal, a professor of mechanical engineering. "This research is important because it attempts to not only address issues related to bio-inspired design of MAVs, but it also explores fundamental questions in biology related to the limits and capabilities of flying insects," Mittal said. To conduct this study, Lin has been using high-speed video to look at how changes in mass distribution associated with the wing flapping and body deformation of a flying insect help it engage in rapid aerial twists and turns. 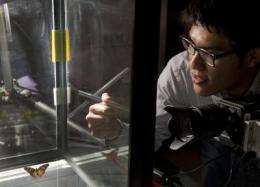 Lin, a junior mechanical engineering major from San Rafael, Calif., recently presented some of his findings at the annual meeting of the American Physical Society's Division of Fluid Dynamics. The student also won second-prize for his presentation of this research at a regional meeting of the American Institute of Aeronautics and Astronautics. "Ice skaters who want to spin faster bring their arms in close to their bodies and extend their arms out when they want to slow down," Lin said. "These positions change the spatial distribution of a skater's mass and modify their moment of inertia; this in turn affects the rotation of the skater's body. An insect may be able to do the same thing with its body and wings." 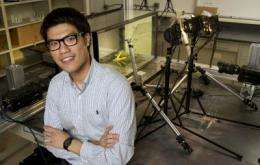 The Johns Hopkins researchers anchored their cameras in fixed positions and focused them on a small region within a dry transparent aquarium tank. For each analysis, several butterflies were released inside the tank. When a butterfly veered into the focal area, Lin switched on the cameras for about two seconds, collecting approximately 6,000 three-dimensional views of the insect's flight maneuvers. From these frames, the student typically homed in on roughly one-fifth of a second of flight, captured in 600 frames. "Butterflies flap their wings about 25 times per second," Lin said. "That's why we had to take so many pictures." The arrangement of the three cameras allowed the researchers to capture three-dimensional data and analyze the movement of the insects' wings and bodies in minute detail. That led to a key discovery. Earlier published research pointed out that an insect's delicate wings possess very little mass compared to the bug's body. As a result, those scholars concluded that changes in spatial distribution of mass associated with wing flapping did not need to be considered in analyzing an insect's flight maneuverability and stability. "We found out that this commonly accepted assumption was not valid, at least for insects such as butterflies," Lin said. "We learned that changes in moment of inertia, which is a property associated with mass distribution, plays an important role in insect flight, just as arm and leg motion does for ice skaters and divers." He said this discovery should be considered by MAV designers and may be useful to biologists who study insect flight dynamics. Lin's newest project involves even smaller bugs. With support from a Johns Hopkins Provost's Undergraduate Research Award, he has begun aiming his video cameras at fruit flies, hoping to solve the mystery of how these insects manage to land upside down on perches. Fifty years ago when I was growing up and into building model airplanes - there were already rubber band powered toy model butterflies - oh about 8"x8" or so and they flew quite well - their flexible plastic film wings being flapped by the wound up rubber band motor. I see they are still making variations today. I wonder if these guys bothered to study those early already working models? While it may not mimic real butterfly flight exactly - it's a much simpler example to study.